The Hammond Boat Basin North Jetty is exposed to the ripping current of the Columbia River main channel but if you dive at slack tide, you can get halfway decent water conditions and a unique experience. Old ruins on the north end of the dive site usually have good marine life although there is the potential for entanglement hazards. Head away from land a few feet and you will find the water gets rapidly deeper as you approach the shipping channel. The Hammond Boat Basin North Jetty is exposed to the ripping current through the main channel of the Columbia River as it rushes the last few miles to the ocean. Old ruins are interesting to check out although there are entanglement hazards. Head north from downtown Hammond toward the boat basin. Follow signs for Seafarer’s Park. There is parking at the north end of Seafarer’s Park. The last time we checked, parking was free although this could change. Be sure to verify with the signs in the park. The dive site sticks along the jetty from the entrance to Hammond Boat Basin at the south and east end of the dive site up to the ruins at the north and west side of the dive site. If you head north and east, you will eventually run into the Columbia River shipping channel. It’s a good idea to stick closer to land where you have at least a little protection from the current. There are several decent entrances and exits along the jetty near the parking area. We marked several on the map above but if you look around a little at the Hammond Boat Basin North Jetty, you will find a few other decent places to climb over the jetty rocks and enter the water. There can be a lot of current at this site. Be sure to dive at slack tide. SCUBA diving here during the tidal exchange could cause you to have a rather unpleasant drift dive. There is regular boat traffic in the area both in the main shipping channel and coming into and out of the Hammond Boat Basin. It’s a good idea to fly a dive flag. Depending on river conditions, you might get only 3 feet of viz or up to 15 feet of viz. Be prepared for low visibility conditions. Temperatures can vary between 45 and 55F depending on the time of year. There doesn’t seem to be one best time of year here. In the summer the parking lot can be full on the weekends. You can find 50+ feet of water if you head toward the main shipping channel. Right along the jetty, the water is shallow (max 15 feet). 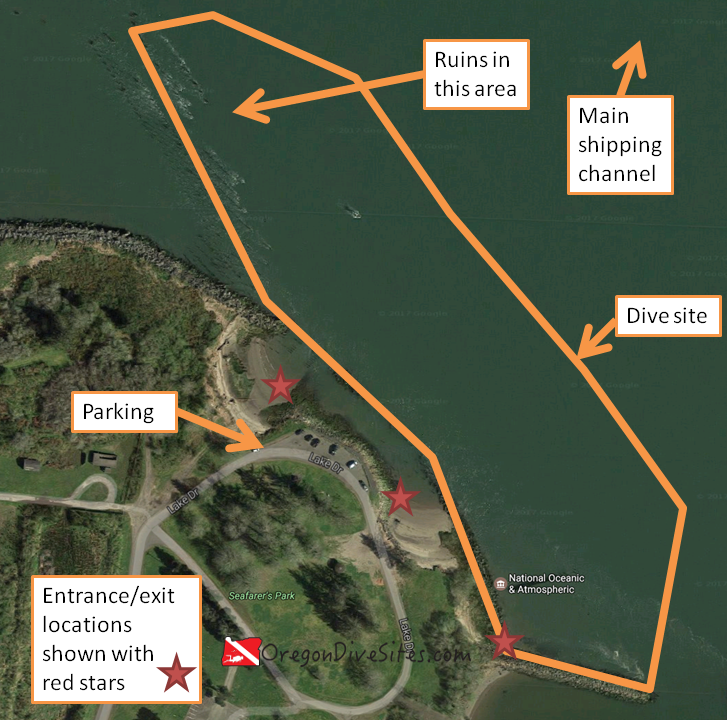 Advanced open water training is a good idea to dive the Hammond Boat Basin North Jetty. Experience with diving in a high current area is also a good idea. We rate this as an intermediate dive because of the current and the risk of entanglement in the old ruins on the north end of the dive site. Depending on where you enter, you might need to walk up to 200 feet. At the entrances near the parking lot, you may need to wade through water before it gets deep enough to swim in. The dive shop in Astoria is full service and has an air fill station. There is decent food in Hammond and great food over in Astoria. There are a lot of public campgrounds in the area with good camping. We haven’t tried any of the local hotels so please let us know if you’ve found one that is SCUBA diver friendly.